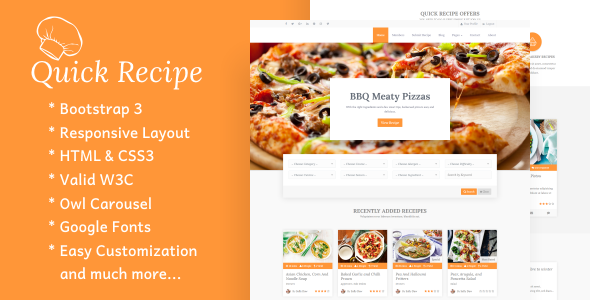 Quick Recipe is a clean and responsive WordPress recipe theme for those who want to share their own or someone elseâ€™s recipes. It allows you to publish your own recipe, customize the home page sections, build rating system, add to favorites and much moreâ€¦. Quick recipe theme works perfectly on mobile, tablet, and desktop. Recipes is also very easy to set up and highly customizable.. This is the perfect theme for your, and your visitorsâ€™ recipes. Fully responsive design looks great on desktop, tablet, and mobile devices. Translation ready with support for RTL languages. Log in/register popup with AJAX.